The great thing about this book is that it’s exactly what you hoped it would be. I find that there’s always a slight caution when expressing excitement that your favourite comedian has written an autobiography, for fear that there won’t be any comedy, and the man you laugh hysterically at is in fact grumpy, grouchy and terribly miserably. Thankfully this is not the case for Mr McIntyre. He somehow managed to recreate his comedy acts to describe his life in writing. His on stage charm is reinvented to suit the requirements of an autobiography, but maintains the wit, charm and flamboyancy he is known and loved for. I often find that celebrity autobiographies are badly written, as though the celebs and publishers alike both know that the book is going to sell well because of who they are, so the content doesn’t really matter. Again this is not the case for Michael McIntyre’s autobiography. Obviously the text is not a literary masterpiece, but it does flow and it is engaging. It’s like having a long conversation, at times McIntyre goes off on a tangent, and he adds funny little snippets in all over the place, but it works. It was so good that I had read the book from cover to cover in less than 48 hours, this is especially impressive given that over Christmas there aren’t many free hours in a day. But do not be deceived. This is not a book of comedy that, aside from a few childhood incidents, retells the joys of a successful comedian living an affluent lifestyle. In fact the book ends as McIntyre becomes successful. This is a book about a man that spent years working towards his dreams, trying to reach his ambitions. This book might be entertaining, but it is also inspiring. Ten out of ten for the nations favourite funny man. Life and Laughing: My Story by Michael McIntyre, published by Michael Joseph (imprint of Penguin) is available now. 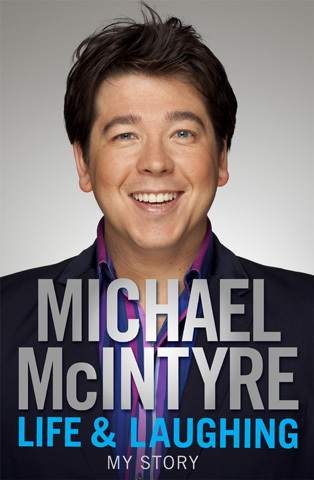 I am not a great fan of biographies or autobiographies, but I am a great fan of Michael McIntyre. We have been to see him live on two occasions, once when our family booked surprise tickets for our anniversary and got us seats in the front row, whilst they sat further back, guess what happened!!! Unfortunately, or fortunately, the theatre in Swindon had just re-opened after major works after asbestos was found and Michael's was the first show. On the night in question there was torrential rain during the show and the roof above the stage started to leak. He finished off the show with buckets on the stage and holding an unbrella. Haha sounds like a very memorable night! I haven't had the chance to see him live yet but I'll definitely be getting tickets next time he's in my area. I just finished reading his book and he really is a great person. His life was difficult at times but he still found the humour in every situation. I never saw him perform live though.